Get helpful hints for sewing or buying the perfect Halloween pirate outfit! Girls & Boys love Pirate Costumes! Girls often like "cute," while boys want grizzley or ghostly! Does your child want to dress as a pirate this Halloween? As you know, a brand new "Pirates of the Caribbean" movie is out for 2011. Jack Sparrow fervor has roared back as strong as ever--and pirate costumes are still favorite choices for Halloween costumes. 2.) Captain Jack Sparrow Costumes, pt 2 talked about sewing or buying a brand-new pirate costume. Or, are you looking for women's pirate costumes? Ideas for women's costumes...plus men's pirate costumes that do NOT look like Jack Sparrow...may be found on the Adult Pirate Costumes page of our site. Girls and boys pirate costumes: sew or buy? 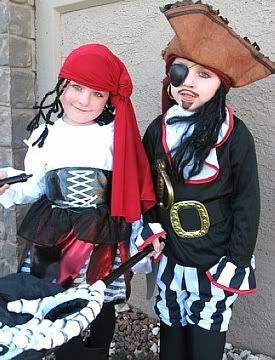 When it comes to kids, there's an abundance of pirate costumes to buy or sew this year. Boy's costumes invariably have an "adventuresome" look. Girl's pirate costumes, on the other hand, can project a range of varied styles. Not only is there the "serious" adventuresome pirate (which can come with either pants or a skirt) but also the "cutie pie" pirate for toddlers and younger girls, and even the "sassy" or "flirty" pirate wench styles for tweens and teens. Advantages of buying a pirate costume: In the picture above, you saw a toddler girl's skirted pirate costume which was a particularly good deal at Walmart. For under $15, this pirate dress was made with unusually high-quality fabric for a bargain-priced Halloween costume. The velvet was soft to the touch; the black and white satiny fabric of the skirt actually had textured polka dots, which gave the pirate costume a nice feel. In addition to the dress, a lace-trimmed, pirate hat (pictured to your right) was included to complete the look. Sometimes it's hard to beat a good deal when you find it online or at the store! Advantages of sewing the pirate costume: (1) It's sometimes difficult to find a good deal on a pirate costume, especially a high-quality outfit. (2) When you sew your pirate costume, you can use the exact fabric you want and use the very best stitching techniques. In the photo to your left, you can see the leg of a purchased pair of boy's pirate pants. As you can plainly notice in the picture, there is no hem on the edge of the pants. Many times, mass-produced Halloween costumes DO have raw edges, which helps keep costume prices down. On the other hand, the advantage of sewing your child or grandchild's Halloween costume yourself is completing the outfit with care; adding polished touches such as sewn hemlines, higher quality fabric, etc. That way, your child's pirate costume can be thrown into the dress-up chest and used for many "pretend" playtime scenarios throughout the coming year...AND be washed repeatedly...all without raveling or coming apart at the seams! Photo note: The darling picture of Baby Jack Sparrow was contributed by Pilar Ash from Oregon. How precious, isn't he? 1.) Simplicity toddler and baby pirate costume pattern #3650, sizes from baby through toddler age 4. Pattern includes boys and skirted girl's variations in the same package. Outfit has 2 main pieces: top, and choice of either pants or skirt. This particular skirt has "plain" hem (not jagged-edged.) The top is meant to be made in 2 colors...so it will look like the arms are really a blouse showing from beneath a vest. 2 pirate accessories are included: a sash and a bandana. Medical scrubs, a cowboy or girl, and a chef costume (with tall chef's hat) are other Halloween or "let's play dress-up" costume patterns included within the package. 2.) Simplicity baby and toddler pirate pattern #2561, comes in sizes which will fit babies 6 months of age through girl's or boy's size 4. Your baby or toddler can become the pirate king or queen in this handsome outfit which features a pirate's formal coat and trousers or skirt. Or...you can choose a more casual style with this pattern, which also includes options for a pirate deck hand or pirate wench. Even the pirate's hat pattern comes included in the packate! 3.) Simplicity girl's pirate dress pattern #3680, which comes in sizes for girl's ages 3 through 8. This girls-only pirate dress features a stylish jagged-edge, multi-layer skirt. The dress is meant to be sewn with different colors for the top & bottom halves to give it the appearance of being a peasant blouse tucked into a skirt. Accessories include a wide belt, a bandana and bloomers (which are intended to show beneath the skirt.) Other patterns within the packet are for witch, fairy, cowgirl and hippie girl costumes...making it an economical choice if you need to make more than one Halloween disguise. 4.) Simplicity kids pirate costume pattern #2505, sizes for boys approximately age 3 through 8. This pattern helps turn one's own clothing into a complete pirate outfit. The pirate ensemble starts out with a boy's own boots, pants and belt. A purchased pirate hat and sword add the essential pirate "look" to the costume. And to complete the outfit, you make this elegant pirate's cape, which would make your son look more like the pirate captain rather than one of the crew. The pattern also includes a sash and a shirt suggested to be made in black and white vertical stripes. 5.) Simplicity pattern #3644, sizes for boys (or girls; no skirt included, though) approximately age 7 through 14. This is the official Disney's Pirates of the Caribbean sewing pattern...and is it ever the pirate's pattern that beat all pirate patterns! Unfortunately, it's not a beginner's project. Nor is it a quick "last minute" costume. But, if you've got the time---and the skill---this pirate costume has "the works." A fancy frock coat is included in this one, unlike most. You'll be able to add the shiny brass buttons and braids (purchased separately) that will make your youngster feel like the most lordly of pirates. This is also one of the few kid's pirate costume patterns which has a separately-sewn vest. The costume's blousy shirt pattern will allow your child to have just the right "look" of the olden days even if he takes off his or her frock coat. Blousy pants and boot covers complete this adventuresome looking pirate's costume. A hat is shown on the pattern cover; however, the pirate's hat pattern is not included; nor is the belt. 6.) Simplicity children's pirate pattern #3997, in sizes Child 3 thru 8 for either boys or girls--- If you've already got a suitable piratey-looking blouse or shirt, this pattern gives you the vest and jagged-edged pants or shirt to go with it. Also included is the pattern for a long, fringed sash to be worn as a belt. The pattern package shows the outfit being complete with purchased eye patch, pirate hat or pirate's parrot...but instructions for these are not included in the pattern packet and must be purchased separately. Cowboy/cowgirl costume, 50's retro outfit, and Army camouflage suit variations are other options which are included along with the pirate costumes, as well. 7.) The following girl's frilly pirate dress pattern is now out of print...but it's such a cute costume you may wish to try to find it on Ebay. Simplicity girl's pirate pattern #3687 comes in sizes for 'tween girls age 7 through 14. This girls-only sassy pirate wench dress uses rows of purchased lace to resemble a petticoat peaking through from beneath the hemline. A decorative corset is worn over the top of the outfit, which gives this costume considerable visual interest. An elegant feathered pirate hat is shown on the pattern package which is not actually included, but would make a terrific addition to the outfit if you can find one to buy. Photo note: Many thanks to the Ivie family for sending the photo of their adorable "pirate kids!" Photo note: In the boy's pirate top to your right, you appear to see the arms of a shirt sticking out from under a vest. In reality, this is a one-piece garment with the sleeves sewn in a contrasting color and type of fabric. Both store-bought and some home-sewn pirate costumes use this technique of simplifying the costume-making process. 1.) Kwik Sew pirate costume pattern #K3804, ranges in sizes "Child's xs to xl" (approximately ages 4 thru 14.) It features a boy's or girl's Halloween costume which can be made into a pirate outfit with either a skirt or pants. The shirt features very blousy sleeves with a front slit, reminiscent of real pirate-era shirts. Other pattern pieces are for the vest, sash, bandanna and hat. A purchased eye patch and sword complete the look. Photo note: Pirate-style pants are often made with blousiness at the waist and legs. Many times, this is done with elastic; other times the pattern calls for adding gathers. One advantage that purchased pirate pants have by using elastic is that an elastic waistline stretches to fit more sizes. 1.) McCall's pirate costume pattern #M5446 can be used to create a "dynamic duo" of the seafaring kind! For kids age 3-8, and adult men sizes s-xl. This is a versatile pattern which can create the look of either a pirate crew member OR a pirate captain. For the crew member's outfit, you'll make pants, shirt, simple separate vest (no lapels, buttons or pockets) and sash/belt. Use a classier fabric, plus make the included coat to look like the captain! This coat is NOT a frock coat like the one worn by Jack Sparrow, but has the advantage of being simpler to make than a real frock coat. A nice-looking purchased pirate's hat will look nice with this ensemble. 2.) McCall's pirate costume pattern #M4952 comes in kid's sizes 3-8 and adults s-xl. Like the Butterick "pirate family" pattern, you can co-ordinate your family Halloween costumes. What are the differences between these 2 patterns? The McCall's pirate family members can wear vests; the Butterick pattern is vest-less. On the other hand, ladies can choose a more feminie neckline with Butterick's pirate woman costume. Also, the Butterick lady pirate wears a skirt, while the McCall's pattern calls for pants. Nevertheless, both are good pirate costumes, and if your family has never "dressed alike" for Halloween, it might be fun to give it a try! Burda patterns, a European company, used to be rather difficult for people in the USA to find. However, now it's easy to get these patterns through Simplicity.com. Burda's pirate costume B2452 for boys age 4-10 makes a handsome captain's outfit. There won't be any doubt that your son is in charge when the deck-swabbers take a look at his fine waistcoat with braided trim and ruffled sleeves. For fast sword-fighting action, he can cast his coat aside for the freedom-of-movement his thigh-long vest provides. Knee pants and boot-like shoe covers complete the outfit. Purchased hat, bandana, sword & eye patch complete the looks shown on the package cover. Here's a link to view Burda costume 2452 so you may check out the details. An alternative Burda boy's pattern you might like is Burda boy's costume B2461. Granted, the package says that this is a prince's royal outfit, but with different accessories, it could make a dashing pirate captain's suit just as easily. This pattern includes instructions for a fancy braid-trimmed waistcoat with fancy jabot, along with knee pants. Simply add boots and a pirate hat, and your son will be set to sail. Sizes for this pattern will fit boys approx. ages 6 thru 12. The Disney theme parks are a good place to buy high-quality pirate costumes. As long as the popularity of the Pirates of the Caribbean ride and movies remains high, you're likely to find pirate costumes on sale at the Disneyland Resort year-round...and beefed up with an extra-large supply near Halloween. Boy's pirate costumes are also available at the Disney California Adventure Park, Walt Disney World and in the World of Disney store locations in Anaheim, CA and Orlando, FL. Another option for pirate costumes at the Disney resorts would be the Captain Hook pirate costume, the red-coated one with which you're familiar from the Peter Pan movie. The Disney Stores, like you'll find in the mall, also sell pirate costumes...at least, during the Halloween season. If you'd like to find a Disney Store location in Southern California, you may check out the Disney Store Locations page of this website. 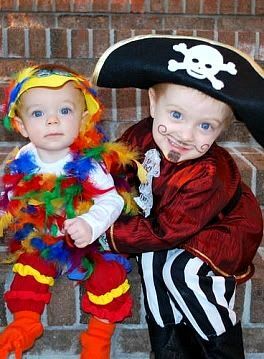 Photo note: Many thanks to the Bailey family for sending the photo of their children's adorable "Pirate Captain with Parrot" pairs costume. Temporary Halloween costume shops and seasonal displays within party-goods stores are another option you can use for finding kids pirate costumes during September and October each year. If you need a pirate costume for other masquerade parties, children's plays or pageants, or simply for "playing dress-ups" when Halloween is just a memory, you'll have to head to one of the year-round costume shops; yes, they DO carry pirate costumes 12 months of the year! Another option would be internet-based costume stores, which also operate no matter what month or season it might be. Discount stores: Another choice for pirate costumes and accessories is simply the Walmart, Targer and Costco discount stores, which sell Halloween costumes seasonally. For inexpensive costumes, Walmart and other discounters may actually carry the same products as a costume shop, but at a cheaper price. On the other hand, your selection at a costume shop may be wider. Some cheap costumes don't look very nice. Others look great. Others look in between; you may have seen better, but Halloween is just one night...so why spend a fortune? Internet costume stores, like our sponsor BuyCostumes.com (whose pirate costume pictures you saw at the top of this page,) can sometimes be a good compromise. They have lower expenses than brick-and-mortar stores, so they can carry a large selection of costumes & accessories while mainting a fairly cheap price. And when they have sales, you may be able to find some terrific blow-out prices. You can buy children's pirate costumes (and adult costumes, too) year-round on the EBay auction website. Some will be new; others used. Some in great condition; others may have seen better days. But that's how it is with auctions! You never know what's coming up next for bid. In the EBay widget below, you can see what children's pirate costumes are on the auction block RIGHT NOW! As each auction expires, the widget updates itself with a new one...so if you return to this page some other time, you'll see an all-different selection of pirate merchandise!